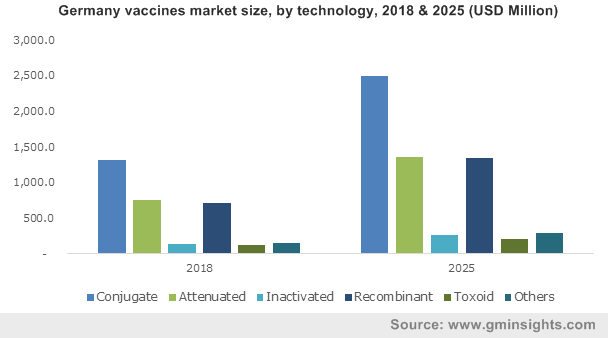 Global Vaccines Market size was valued over USD 38.5 billion in 2018 and is expected to witness more than 9% CAGR from 2019 to 2025. Rising prevalence of several infectious and non-infectious diseases globally coupled with increasing funding for vaccine development will drive the global market size. Growing demand for preventive vaccines, rising awareness coupled with mounting demand among the developing countries should boost the business revenue. Immunization currently prevents an estimated 2 to 3 million deaths every year. Furthermore, additional 1.5 million deaths could be evaded through improved global vaccination coverage. Increasing uptake of new and underused vaccines will prominently intensify its global usage over the forecast years. Technological advances, rising demand for low cost products and widespread routine vaccination programmes in emerging economies will stimulate the business growth. 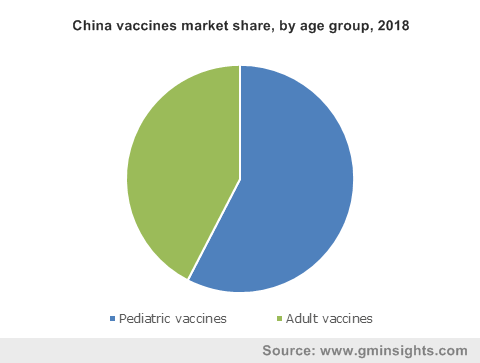 Increasing demand for combined vaccines that offers immunization against several diseases, growing initiatives for production of low-cost vaccines will further boost the industry growth. Growing adoption of cancer therapeutic vaccines, improved patient compliance along with mounting product pipeline will drive the business growth. Growing efforts to help avert adverse reactions and adoption of appropriate preventive screening methods will propel the business size. Prohibitive cost associated with storage and transportation of vaccines will restrain the industry growth. Limited reimbursement coverage and stringent government regulations for the approval of products will further hamper the business expansion over the coming years. Paediatric segment accounted for more than 50% market share in 2018 and is forecast to witness substantial growth over the forecast years. Improved level of vaccine recommendation by CDC for monotonous immunization for children below 6 years will fuel the business growth. Therapeutic is set to witness significant growth owing to its vital role in cancer treatment by boosting the vaccines' influence through merging them with treatments that target the immune system. Conjugate segment held the largest market share in 2018 and is anticipated to witness 9.5% CAGR over the forecast period. The ability to reduce asymptomatic carriage of the bacteria and produce immunological memory, better-quality memory and long-lasting protection will boost the industry size. Cancer segment accounted for USD 1.6 billion in 2018 owing to the ability of vaccines by protecting immune system to control, or get rid of, an otherwise difficult to treat condition. Influenza disease segment are estimated to grow at noteworthy rate over the coming years. Growing disease prevalence in emerging economies coupled with increased disease mortality will boost the segment growth. Germany will grow at 9.3% over the coming years owing to increasing government initiatives to offer medical advice for the vaccinating children. Rising prevalence of infectious diseases and focused product development will fuel industry expansion. U.S. accounted for more than 35% market share of global market in 2018. Growing initiatives by HHS to reduce infectious diseases by increasing immunization rates and immunization recommendations will fuel U.S. market growth. For instance, the Healthy People 2020 aims for immunization to prevent and treat infectious diseases. Asia Pacific will witness significant growth over the forecast period due to increasing awareness for prevention of diseases, improving economic settings and growing adoption for advanced technology should accelerate regional revenue share. 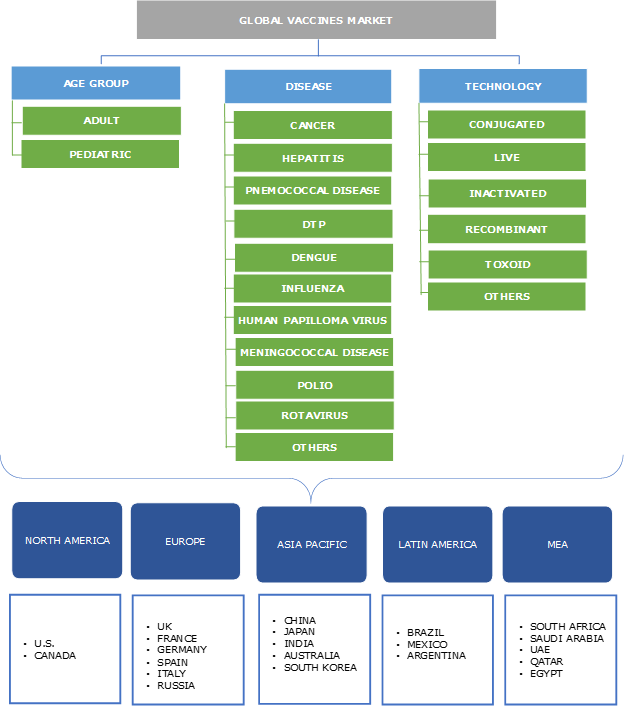 Some of the major players in global market are AstraZeneca, Abbott, Bristol-Myers Squibb, Merck & Co., Johnson & Johnson, Sanofi Pasteur, Pfizer, GlaxoSmithKline, Emergent BioSolutions, Novartis, Astellas Pharma, CSL and Novavax. Industry players focus on new product development, mergers, and acquisition to strengthen their market position. Companies should face intense competition for development of novel products. Vaccines market is highly fragmented with presence of few big market players offering wide range of products so far and are focusing of increasing pipeline products. Industry players will mainly emphasize on development of combined vaccines over the coming years. The industry is projected to undergo momentous expansion over the next decade.